You’ve all heard of ‘urban legends.’ Well, in Hawai'i we have ‘island legends.’ And some of the most commonly retold are stories of visitors to Hawai'i suffering streaks of bad luck after taking home lava rocks or beach sand. There’s no scientific proof that taking lava rocks back to Kansas will cause you to fall and break your leg. Or that a lava rock on your living room shelf means that the next tornado will carry your house away. But people get spooked when they start to link something bad with the fact that they took something they knew they probably shouldn’t have. No one knows the origins of this ‘bad luck’ legend. Some people say that the rangers at Hawai'i Volcanoes National Park started this legend decades ago to stop people from picking up lava rocks and carrying them away. The rangers, of course, deny this. 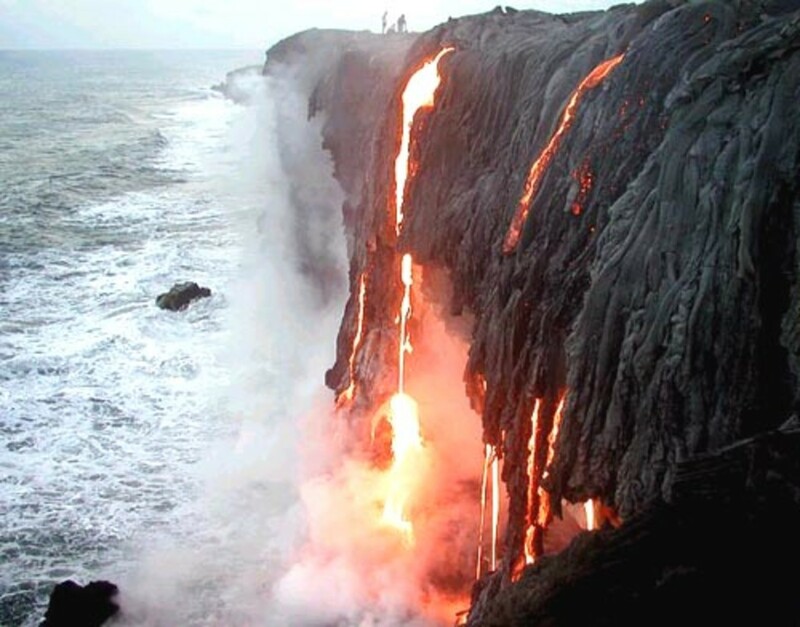 Molten lava flowing into the ocean off the southeastern coast of the Big Island. After a Hawaiian vacation some people find themselves with a string of bad luck and a lava rock in their suitcase that they want to send back. Our family used to own a visitor garden on the Big Island of Hawai'i, and we’d get letters and packages all the time with lava rocks in them and written apologies asking us to place the rock back ‘where it belongs’. We would dutifully place the rock back onto the fertile island soil with a little prayer for the sender’s health and happiness. So if you have a lava rock you want to return, just know that you’re not alone. Thousands of pounds of lava rocks are returned to the Islands of Hawai'i each year. Federal law prohibits removing anything from Hawai'i Volcanoes National Park, but I’ve never heard of anyone being punished for taking a lava rock. 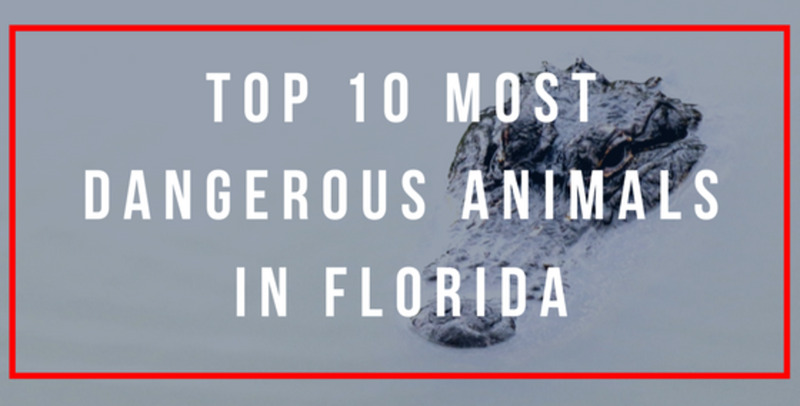 It’s not illegal to take sand from the beaches unless it’s more than a gallon a day or for commercial purposes. Whether it’s a lava rock or sand that you want to return, you won’t be in any trouble with the law by returning it. 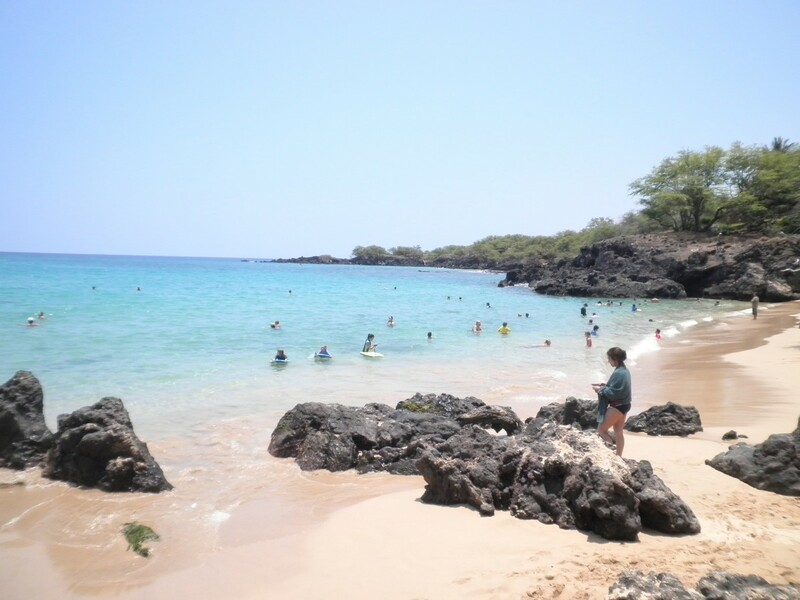 Sand from Hawaii state beaches can be sent to: Division of State Parks, P.O. Box 621, Honolulu, HI 96809. They will try to return it to the island of origin if you let them know where you got the sand. On a final note: No one is going to call you to let you know that your lava rock is safely back in Pele’s bosom, so be sure to pay a little extra (75 cents I think) for a Delivery Confirmation to let you know that your box was delivered. You can even track your box online at the US Postal Service website after you mail it off. I took red and black sand from our trip to Haha for a vacation box idea. Should I return the sand? If you only have a small amount of sand and have good intentions for its use, I'd say to go ahead and do your vacation box. With over 9 million visitors a year, you can imagine what our beaches would look like if everybody took sand. If someone came back from Hawaii and gave me a lava rock does that mean I’m cursed? I did ask for it before I realized it was bad luck. We visited Oahu almost a year ago; I cannot begin to describe the terrible luck we've had over the last 10 months. IF we brought home anything we shouldn't have it was by mistake, and neither of us knows about it. If this is the source of our terrible luck, is there a way to "reverse the curse" from Hawai'i without knowing what the item was that we mistakenly took? I'm sorry to hear about your bad luck since visiting Hawaii. It doesn't sound like anything from Hawaii is the cause of it. I'll say a little prayer for you in hopes that the karma clears up. I took sand from Hawai'i in 2009. My now ex wife dumped it out. I just found remnants of it and have carefully swept it up and put it in a bottle. If I send what I have back will it remove the curse? I'm sorry that the sand has been causing you negative vibes for years now. I don't think that there is any curse related to it. If you want to clear yourself of the negativity, you might consider taking it to the beach, a lake or river and releasing the sand. It will find its way home. Or you could use it in the soil surrounding a flowering plant. The sand would then be helping to give life to something else. Is buying a volcanic rock bracelet in Kona bad luck? A client brought a lava rock back from Hawaii and gave it to me as a gift. Is the bad luck with them, or me? If there is any bad luck, it would usually be on the person who committed the offense. In this case, your client. But just to be sure, Iʻd return the lava rock to Hawaii where it belongs. My grandma took lava rocks from Hawai'i. We've all had bad luck since then, and she doesn't know where they are. Is there a way to get rid of the curse without them? 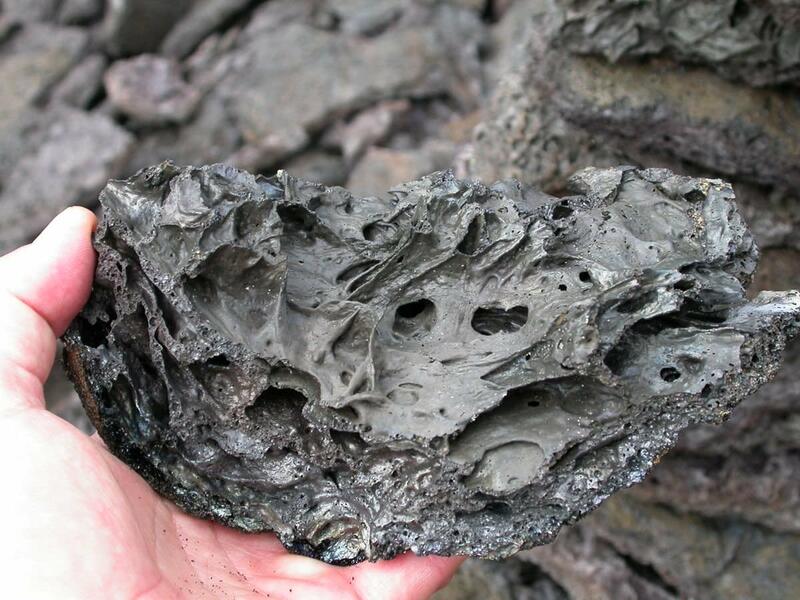 Maybe your string of bad luck didnʻt have anything to do with the lava rocks. Since your grandma doesnʻt know where the rocks are, the best thing you can do to restore the balance in your life is to do a random kindness for someone else. And if you know anyone else who is going to visit Hawaii, please tell them not to take lava rocks and to leave them where they see them. I took to small shells from Oahu. Do I need to return them to the Island? No, I wouldn't worry about it. If it bothers you to have them, drop them in the ocean the next time you get to a beach and they will find their way home. Aloha. Is lava rock with a plant that is purchased at Honolulu airport bad luck? I don't think so. 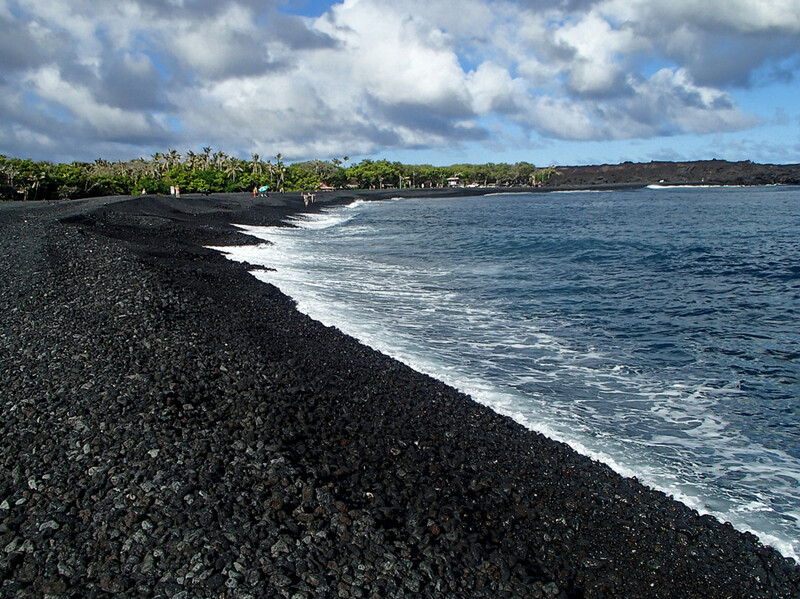 This article is about the legend surrounding lava rocks removed from the islands. In part, Hawaii residents would love for businesses and tourists to stop taking rocks off the island, especially for profit. In your case, I think the mercenaries selling lava rocks have more to worry about than you do. Have a safe trip home. 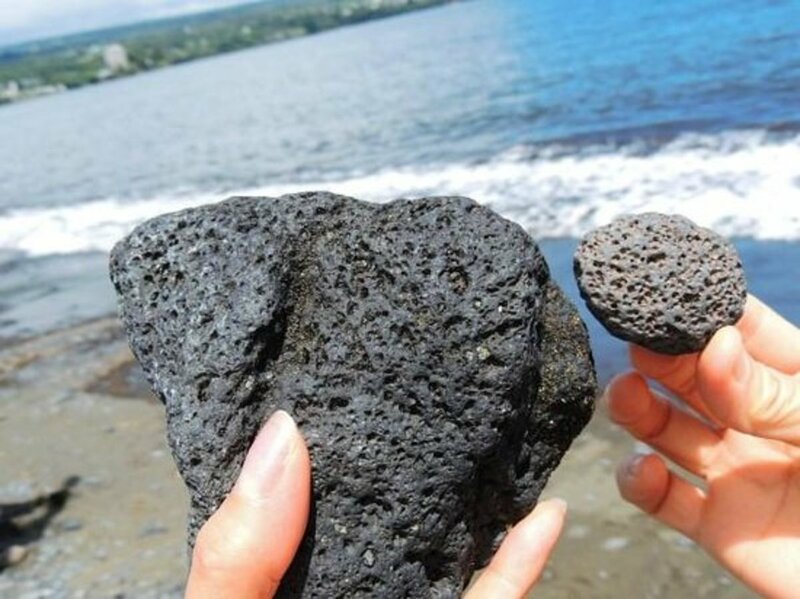 If we took lava rocks from the black sand beach on Maui, is it possible to return the rocks to another beach on a different island? We bought a house on Oahu, and I've got a ton of lava rocks in the landscaping. Is it ok to give away to others on the island? I don't want them, and I don't know what to do with them. Absolutely. It's a great idea to give them to others who will use them in their front or backyards. Often, there are people giving away free lava rocks on Craigslist, and there's nothing wrong with that. Some people build retaining walls for their yards with the rocks too. If I got sand from Maui, where would I send it back to? They will try to return it to the island of origin if you let them know where you got the sand. I got the green sand from Grand Sand beach on Hawaii's big island. 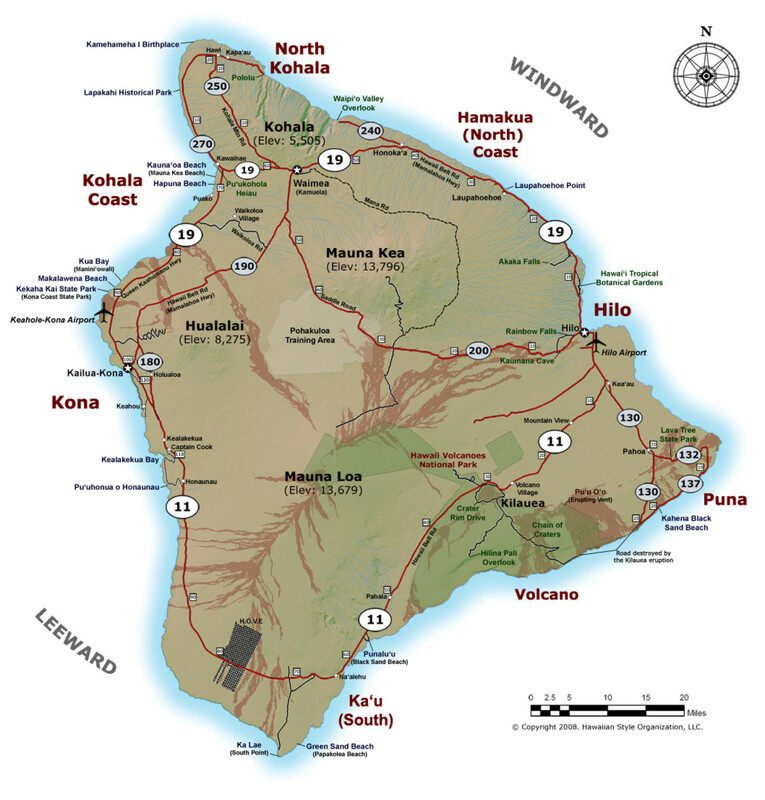 Should I return to volcano national park or division of state parks in Honolulu? This Honolulu office is in charge of state beaches. Sand from Hawaii state beaches can be sent to: Division of State Parks, P.O. Box 621, Honolulu, HI 96809. They will try to return it to the island of origin if you let them know where you got the sand. Are seashells and bits of coral that washed ashore okay to take home? Also, I went to the Blowhole and have a few small pieces of lava from there. Is the Star of the Sea Painted Church in danger, and will it be moved again? If you have your own experience with lava rocks, I'd love to hear from you. In 1972, I visited several islands in Hawaii and honestly felt that I had returned home. I fell completely in love with the islands and the people. I was fascinated by their ancient history, folkways and beliefs. While on the "Big Island" I visited Volcanoes National Park and walked the Devastation Trail. I picked up a small piece of ash or lava - less than the size of a ping pong ball - as a keepsake of that day. Years later, back home, I began to realize that I had made a big mistake to take part of Pele's body from the island. It has caused me great pain and suffering over the years. I wish to finally return it now that I have finally found it among the many seas shells I've collected over the years. I hope that the goddess will forgive me. I'm mailing it back to Hawai'i National Park. Do you think someone there will be kind enough to toss it back onto the Devastation Trail for me, if I enclose a note to that effect? Thanks in advance for your answer. I bought a lava bracelet and a ring from a store? Is that considered bad luck also? Should I return the jewelry I bought? It was in my luggage, which I'm still waiting for it to be returned cause it was lost at the airport. Thank you, Ms Launiu. It was one of the corals that was on the sand/shore. Closer to the road, I assume it's dead. It was not in the water. We're sorry. We went to Hanauma Bay and watched the coral reef safety video so he knew not to step on the living corals or break off any pieces. :) Thank you for giving me the peace I needed. Mahalo! Does coral count? My son, without knowing of this legend, took a coral home. I just saw it while unpacking. We've had a few more misfortunes and some close calls than usual since we've left Hawaii but could it be related??? Help. No Kristen, there isn't any specific prayer to reverse bad luck you might have had. I don't want to give you the idea that any bad luck you experienced was a 'curse". If you sent the lava rocks back and you feel good about doing that, I would encourage you to keep a positive state of mind and think over all of the positive memories you have about your trip to Hawaii. Aloha! After sending it back, is there a Hawaiian prayer that will help reverse any bad luck that might otherwise come? Mahalo Alanna. I just emailed you. Aloha Stephanie, I am producing a new series for a major television network. I would LOVE to speak to you at your earliest convenience. I have rocks from Haleakala and The Road To Hana and Kua Loa Ranch. I am truly sorry and disappointed in myself for not even taking it seriously or even knowing at the time even though I knew they said not to take rocks from the Haleakala. Hana and Kua Loa I'm not sure about but I don't mind finding a way to send them back too. I truly hope that mailing them would help reconnect them and also that it's known they came from me. I would prefer those are returned in the same spot and I even have pictures of where I took them. But, I want to know if anyone else noticed an improvement after mailing? Would it be better to return them in person? The night we were leaving, I got very sick on the plane in a way I never had before, like my blood ran cold. I felt like I might have died but just prayed I wouldn't. But I also had some rocks in my pocket. Someone in my family has recently been diagnosed with an unusual skin condition and has suffered other mysterious symptoms. Among some other things happened to us, but not sure anymore if they are just coincidence. Either way, I feel devasted and very sorry. Include whatever you want to return in the box. It's also a good idea to send it by priority mail so that you can get a receipt when the items are delivered so that you know when they have returned to the islands. my parents took a recent trip to the Hawai'ian islands and my mother brought back lava rocks for her grandchildren without true knowledge or understanding that she should not have done this. I truly hope my family is forgiven and this curse is lifted! This is sillly , This is made up by the national parks to discorige people from taking rocks from the park . The touer companies went along this was back in the seventies . You know you can get Hawaiian lava rocks at garden supplies , right? I have a couple of small rocks that were sent to me by a friend who lives in Hilo (along with some shells, kukui nuts, driftwood, and a little sand), because she knows how strongly I was affected by my visit to Hawai'i and what a clear sense of "home" I experienced there. I didn't ask for the rocks, but I do treasure them. I wear one on a bracelet almost all the time. I haven't noticed any more bad luck than usual, but should I return these rocks anyway? Thanks for this article. I've been wondering about a related question. A year or so ago, a friend who lives on the Big Island sent me a few small rocks she picked up on the beach bear Hilo, as well as some shells, kukui nuts, and driftwood. She sent them because she knows how strongly my visit there affected me and how clearly I felt Hawai'i is my true home, even though I've only been there once. I treasure the rocks and wear one (and a shell) on a bracket almost all the time. I did not take the rocks, nor did I ask for them. They were a gift from a friend. I haven't felt any more bad luck in my life than usual. But I still wonder if I should return them. I felt a closer connection to Hina when I was there than to Pele, but I certainly don't want to anger the Great Volcano Goddess!!! I recently bought lava beads in Georgia to make bracelets, not knowing the history of lava. Would that be bad luck? If I sell this bracelets? I did not take it from Hawaii just bought it at a local bead store. I saw a sign closer to the Visitor Center near the Haleakalā National Park Summit saying not to take rocks because on the rocks there might be some microbial life or some other life living on or inside the rock. I picked up a rock which was tiny hoping no problem. As soon as i came home it was all bad luck. So as soon i looked up this article and other articles I immediately sent the Lava Rock to the address mentioned in this article to Maui. I am really sorry to have picked up the lava rock, please do forgive me . One of my dear friends gave me a beautiful shell bracelet with some small black rocks stuck in it as a bridal gift for attending her wedding on the Big Island.Her sister in law picked and found the shell on the island. At first, I thought hitting my head several times, getting a minor concussion was no big thing. However upon returning home, I was sick and continued to be sick first with a severe cough for about three weeks, followed by flu like symptoms for over one month. I decided to give the bracelet back to Hawaii island. I hope I get better. my husband brought back lava rocks from hawaii as a child and because of the bad luck, his mother tossed them out the car window driving down the road one day. He still has bad luck. is there a way to remove the course without the rocks? any help would be great! Write on! Visitors need to be aware of this energy and leave the island rocks to the islands and its ancestors. Back in the 1970s, I "saw," while walking along a small trail away from the towns on Big Island, King Kamahameha and his warriors marching toward me dressed in full regalia and headdresses. I heeded the legend of Pele and did not turn to look at them after they had passed through the spot where I stood with the hairs on my arms straight out from my body. All of us are a lot more immortal than we have been taught to believe. That's why people mail the stolen lava ricks back to their home. Quite interesting and helpful! I've always abided by the rule - Leave No Trace.... take only photographs and leave only footprints. That way, I don't have to have superstitious thoughts/beliefs. I wonder how many people return lava rocks to the Hawaiian islands every year? And I think its close to impossible to leave Hawaii without at least a little bit of sand in your suitcase! LOL! I'm not saying I believe in ghosts, but I once lived in a haunted house. The same thing applies here - I'm not sure I believe taking lava rocks is bad luck, but you're not going to find me doing it! There's just no reason to tempt fate. @GuitarGear - Thanks for sharing your aunt's experience. I didn't want to spook anyone with this hub, but wanted those who needed it to have information on how they could return rocks to Hawaii. I hope this makes someone's life a little easier. Aloha! 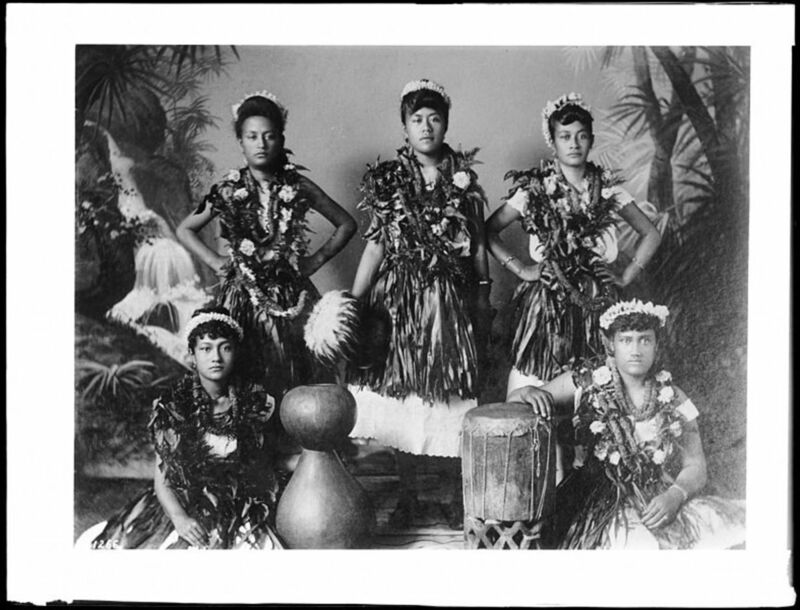 My aunt was a school teacher on Oahu. On a field trip to the big island one of her students picked up a lava rock and brought it back to the classroom without her knowledge. After a string of unfortunate events she somehow discovered the rock still in the student's desk. She returned it to the site where it was found and things returned to normal. When I was there on a visit she cautioned me against taking lava rocks back with me to the mainland as souvenirs and told me this story. I took it as a safety tip and in turn pass it on to friends who are headed to Hawaii on vacation. Thanks! 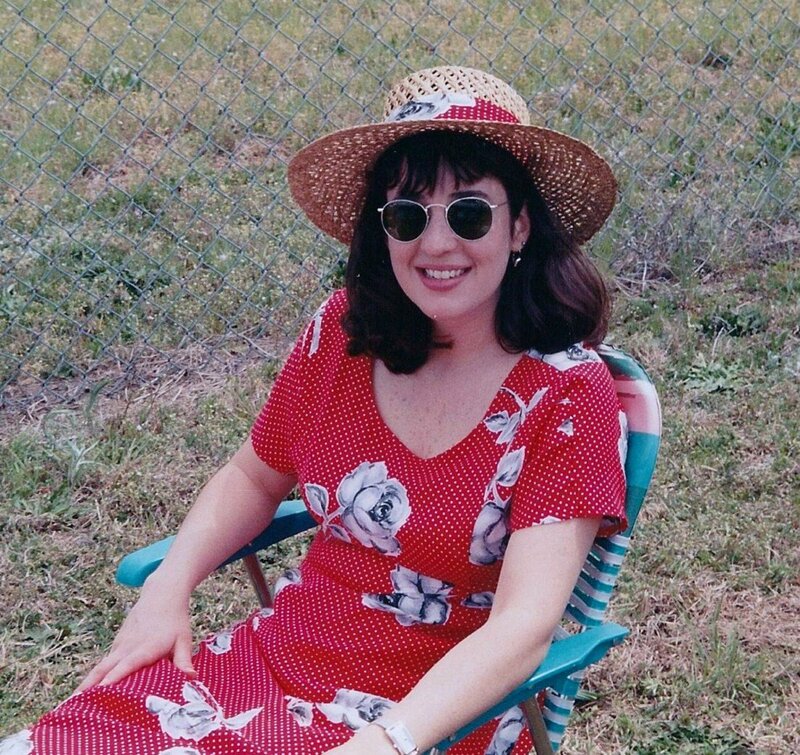 @Nell Rose: Thanks so much for your kind comments. @moonlake: I do hope you will be able to make a trip to Hawaii someday & will remember the story of the lava rocks. @hawaiianodysseus: Great to hear from you. Thanks for reading my hub. Hau'oli Makahiki Hou! This is very interesting. I never knew this if I make it to Hawaii I will make sure not to bring home lava rocks. I don't need any bad luck. Voted up and shared. How very interesting, Hawaiian scribe! Thanks for sharing this information! Hope you and yours are off to a great start in 2013! 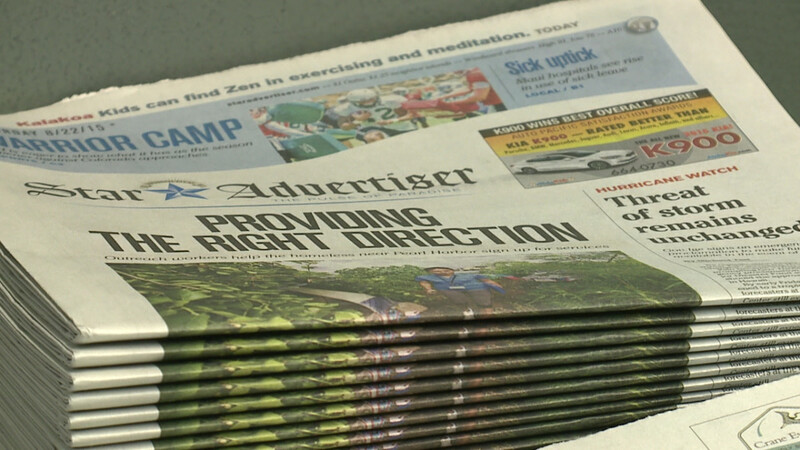 Nice to read a new article of yours! Aloha!